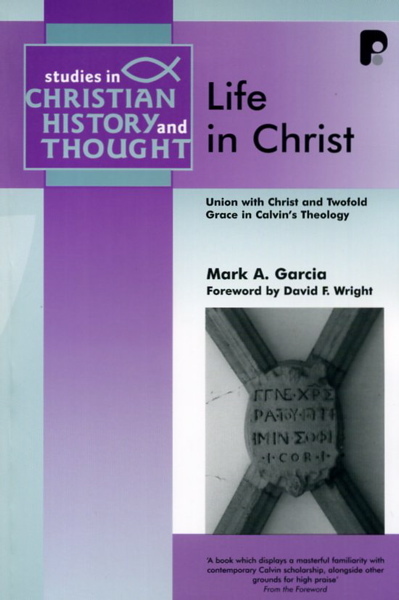 Life in Christ: Union with Christ and Twofold Grace in Calvin’s Theology, by Mark A. Garcia. Published by Paternoster, 2008. Paperback, 380 pages, list price $46.00 (Wipf and Stock, $36.80). Reviewed by Prof. Cornelis P. Venema of Mid-America Reformed Seminary. This book, which is a "light revision" of the author’s doctoral dissertation, examines Calvin's doctrine of union with Christ and its double benefit of justification and sanctification. In view of the contemporary Reformed debates regarding justification and its relation to good works, this volume will prove instructive as an examination of the soteriology of the leading theologian in the Reformed tradition. Garcia examines three "case studies" in Calvin's writings that illustrate the fundamental importance of union with Christ for soteriology. The three cases are Calvin's commentary on Romans, his polemics with Lutheran theologians regarding sacramental union with Christ, and his dispute with the Lutheran theologian Osiander. Each case shows how Calvin develops his view that the believer's incorporation into Christ, which is effected by the Holy Spirit through faith, simultaneously grants free acceptance with God and sanctification of life in good works. According to Garcia, Calvin's doctrine of union with Christ enables him to coordinate this double grace in a way that is distinct from the Lutheran tradition. Whereas in the Lutheran tradition, salvation tends to be reduced to the grace of justification, Calvin insists that the faith that appropriates Christ's righteousness for justification is always and necessarily an obedient faith. Moreover, contrary to the Lutheran tendency to view sanctification as a "fruit" or "effect" of justifying faith, Calvin regards union with Christ as the root of the believer’s sanctification. Students of Calvin and the Reformation will find much of value in Garcia's study. Garcia demonstrates convincingly that Calvin avoids the errors of both moralism and antinomianism. Although believers who are united to Christ enjoy free justification upon the basis of Christ’s righteousness alone, which is received by faith alone, they are simultaneously and necessarily renewed after the image of Jesus Christ. However, Garcia may overstate his case. Although Calvin undoubtedly insists upon the inseparability of justification and sanctification in the framework of union with Christ, he does emphasize the priority of justification in two significant respects. First, Calvin speaks of justification as the "main hinge of the Christian religion" in Book 3 of his Institutes. He frequently speaks of justification as the "first" or "principal" benefit of saving union with Christ. And second, contrary to Garcia’s thesis, Calvin does treat sanctification as the "fruit" or "effect" of justification. Although Calvin always regards justification and sanctification as "simultaneous" benefits, he does argue that sanctification can flourish only within the framework of Christian "freedom" from the law that justification alone secures.